Until 1988, UK radio was affected by what was known as “Needle Time”: a restriction created by the Musicians’ Union and Phonographic Performance. This meant that no more than a certain limit number of hours of album-sourced music was allowed to be played on the air. In order to bypass this obstacle, many artists recorded versions of their songs specifically for the BBC. Not only they would promote the album, but this also allowed artists to test yet-unreleased songs or record other oddities. Usually, artists were given about six hours to record and mix the tracks, so even though they were studio takes, they had little time to do any kind of overdub, so there was a lot of live feel. Unfortunately, the BBC didn’t really think that those recordings had any kind of historical value, so until around 1977, after six months, the master tapes were wiped, in order to spare costs for new tape. This way, lots of things were lost. Of course, a lot of sessions managed to survive: radio listeners would tape them off the radio, engineers would forget to wipe certain tapes (willingly or by mistake) or the sessions would be printed into so-called “Transcription Discs”, which are special LPs with BBC programs to import overseas (many times, the DJ on the Transcription Discs was Brian Matthews, and this explains why his voice is heard so much on archival releases). Additionally, DJs like John Peel have admitted to have hid some session tapes from the hands of the engineers. Between 1967 and 1973, Family recorded a grand total of 25 BBC radio sessions. Usually, bands only relied on BBC sessions only for promotion at the very beginning of their career, but Family was a popular band among many DJs, so they did from the beginning until the end of their carrier. Starting from 2004 Hux Records made an attempt to release as many of these as possible. The first two volumes, “1968-1969” and “1971-1973” respectively, use only the sessions which survived from either master tapes or transcription discs, while the third volume, “1970”, has two sessions taken from off-air recordings. Additionally, the 1973 “In Concert” appearance was released in 1993 as “BBC radio 1 – In Concert” and the 1971 in 2003 as “Family live”, and their last session was released in 1988 as an EP called “The Peel Sessions”. However, only 14 of their 25 BBC sessions have been released, three of which in an incomplete form. Not all of what has not seen the light of the day has been lost, though: there are at least three additional sessions (only one surviving in complete form) and the songs excluded from the above mentioned three sessions survive. “Peace of Mind” and “Voyage” survive from off air recordings, but the remaining tracks are seemingly missing. Three tracks were repeated at an unknown date during late 1967 on Alexis Korner’s “Rhythm’n’blues Show” (surviving two tracks from this session are sourced from the repeat). An article printed on “Record Collector” #84 (August 1986) by journalist Brian Hogg contains a comment seem to allude to the fact that a tape of this session exist (‘Family continued to build their reputation with an early session on John Peel’s “Top Gear”, which confirmed their excellence for anyone who hadn’t managed to see them live. On this appearance they previewed some of the material which would appear on their later releases, including a superb version of “Hey Mr. Policeman” ‘), but, if this is the case, it doesn’t seem to be widely circulated. Session seemingly missing. Interesting to note that, at the time of the airing of this session, “Music In A Doll’s House” had just been released (19 July 1968), and the band was already previewing songs that would wound up on their next LP only on March of the following year. First three tracks survive from off air recordings, remaining two tracks seemingly missing. “The Breeze” aired for the first time when the session was repeated on John Peel’s “Top Gear” on 15 September 1968. Full session survives, officially released on “BBC Radio Volume 1 – 1968 – 69”. This session was also re-broadcast on Tommy Vance’s “Friday Rock Show” on 20 April 1979, along with three tracks from session #14, and on 21 March 1980 (minus “The Breeze”). Full session survives from off-air recording. Full session survives (four tracks from transcription discs, one from an off air recording), first three tracks officially released on “BBC Radio Volume 1 – 1968 – 69”. “Hometown” is the only known song available on a transcription disc not to have been officially released. This is because the after mentioned transcription disc was one in private hands and not in possession of the BBC, so, at the time of the release, Hux Records didn’t have that track available. “Hometown” aired for the first time on the repeat of the session, on John Peel’s “Top Gear” on 5 January 1969. Marc Riley, in January 2013, did rebroadcast three songs from this session: “Second Generation Woman” on the 21st, “Observations From A Hill” on the 22nd and “Dim” on the 23rd. Full session survives, officially released on “BBC Radio Volume 1 – 1968 – 69”. Session seemingly missing. As this session was a live broadcast, no logs exists about which songs were aired and, since as of this writings there are no available tapes of it, it is still not known what songs Family performed. First three tracks officially released on “BBC Radio Volume 1 – 1968 – 1969”, remaining track survives from off-air recording. The whole session was repeated on John Peel’s “Top Gear” on 27 April 1969. Full session survives, officially released on “BBC Radio Volume 1 – 1968 – 1969”. Whole session was repeated on John Peel’s “Top Gear”, 1 November 1969. Additionally,“The Cat and The Rat” was included in “Top Gear” ‘s 1969 Christmas special, aired 27 December and, along with “Drowned in Wine” during the penultimate episode of the program, 22 September 1975. It was later repeat (minus “Drowned in Wine”) on Tommy Vance’s “Friday Rock Show” on 20 April 1979, along with session #6. The session was also recently repeated on “BBC 6 Music Live Hour” on 8 August 2010, 27 February 2011 (minus “No Mule’s Fool”) and 13 January 2013 (minus “The Cat and The Rat”). 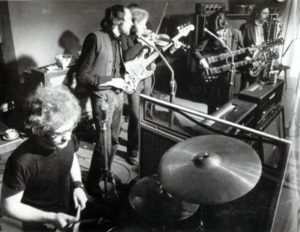 Full session survives, officially released on “BBC Radio Volume 3 – 1970”. The band was originally booked to perform a full set, but Roger Chapman was hit by stomach flu and couldn’t sing, so Tyrannosaurus Rex were added on the bill, and Family only performed a short instrumental set. Additionally three album tracks were played on the original broadcast, to complement the set: “Love is a Sleeper”, “Stop The Traffic (Through The Heart of Me)” and “Song For Sinking Lovers”. Those were taken from the “A Song For Me” LP, and not unique BBC recordings. 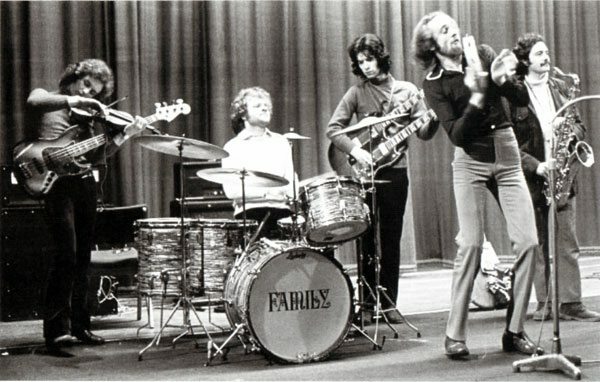 Full session survives from an off-air recording, first two tracks officially released on “BBC Radio Volume 3 – 1970”. Whole session was repeated on John Peel’s “Top Gear”, 5 December 1970, and “Lives and Ladies” was played during “Top Gear” ’s 1970 Christmas episode, aired 26 December 1970. Full session survives from off-air recordings, officially released on “BBC Radio Volume 3 – 1970” with John Peel’s introductions removed. Full session survives, officially released on “BBC Radio Volume 2 – 1971-73”. This is the first confirmed session to have been recorded in stereo. Full session survives, officially released on “BBC Radio Volume 2 – 1971-73”. The session was recently repeated on “BBC 6 Music Live Hour” on 13 June 2013. Full session survives, officially released on “BBC Radio Volume 2 – 1971-73”. Full session survives, officially released on “Family Live”, with John Peel’s introductions removed. The full set was re-aired on “John Peel’s Show”, 19 August 1977. Session seemingly missing. Unfortunately, it looks like all the material recorded for the BBC in 1972 does not survive to this day. Full session survives, officially released on “BBC Radio 1 Live In Concert”, with Pete Drummond’s introductions removed and fake-looped applause. Full session survives, officially released first in 1988 on “The Peel Sessions” EP, then re-released on “BBC Radio Volume 2 – 1971-73”. Whole session was repeated on John Peel’s “Top Gear” on 31 July 1973. Final session by the band. Special thanks to Jacopo Muneratti for contributing his extensive research and compiling this page. I have radio one and BBC sessions 1&3. Would be very interested in getting my hands on anything else available.